I grew up in the mid-80s and early 90s Assam, India where we celebrated our birthday parties with home made food even the cake was made by our moms. There was no elaborate decorations or video games or pizzas. However, our happiness or celebration was not any less than today's birthday. As every childhood has its own charming tale. Those were the days indeed. In those times, the menus were fixed almost for every household. Crisp Luchi (fried dough) was a must have for a birthday or any other celebrations accompanied with green gram thick velvety gravy and succulent tomato chutney (bilahir tok). The other day my daughter completed five years. It was on a weekday, and we celebrated it at home, and on Saturday she is going have her actual birthday party with friends. I thought why not celebrate it in our old back home way, how we used to. Just like my mom, I made luchi and quintessential bilahir tok. They say, you re-live your childhood through your children. Ah, how true. I remember how my mom used to get up in the morning and prepare. How the fragrance waft into our taste buds. How heavenly it felt with those flavors and fragrances. Today, I thought why not with this post share my favorite bilahir tok. Hope you all will like it. First, cut the tomatoes into bite size pieces. Put a pan on the stove on low to medium heat and add oil of your choice. I use either mustard oil or olive oil. 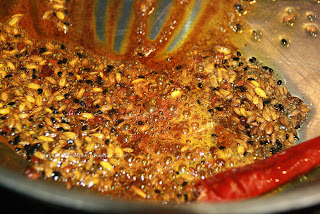 Then put the whole spices in the oil and once it starts to crack put the turmeric and chili powder. Adding chili powder gives a nice color to the chutney, of course, it's optional. While putting the chili powder your heat should be low otherwise it will burn. Then add the tomato pieces. Stir it until it gets mussy and cover it for 5 to 7 minutes on low heat. After that add jaggery or molasses and stir it for 2 to 3 minutes. 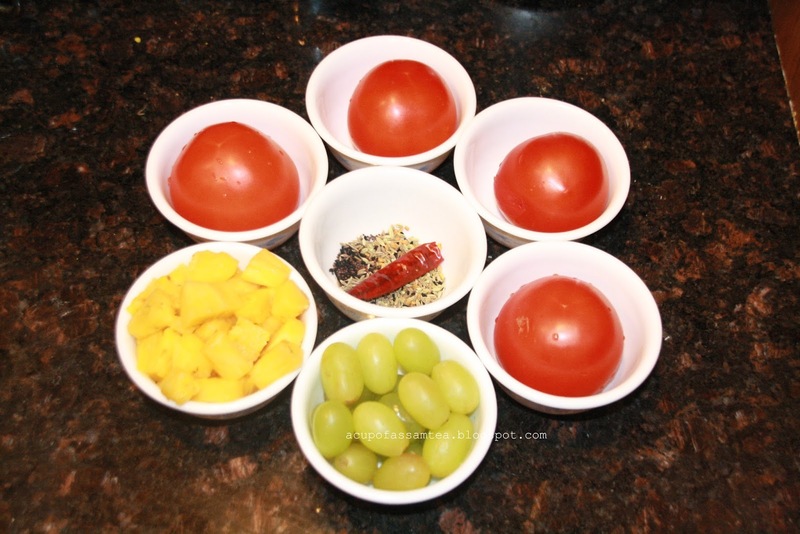 Once all ingredients get mixed, add grapes and after 2 to 3 minutes add pineapple pieces. Stir it gently, cover it and cook for 5 minutes on low to medium heat. Done. 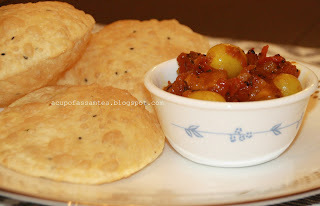 Now it is ready to serve with puffed luchi. It goes well with steamed rice or pilaf too. We had it with luchi. We went through a little guilt trip, but it's worth to have when it brings you the joy of your childhood memories. Sorry, my one more excuse for eating fried food. 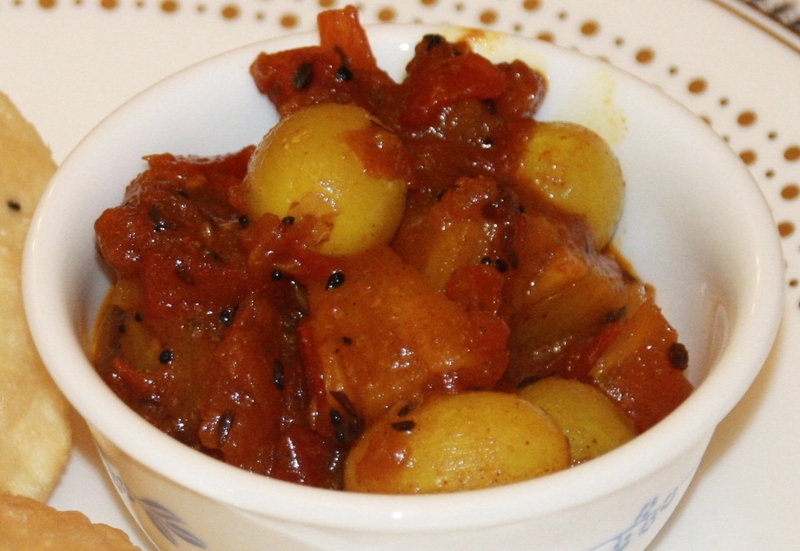 This recipe is very popular in both Assam and West Bengal, India. However, my preparation is not exactly the traditional way. 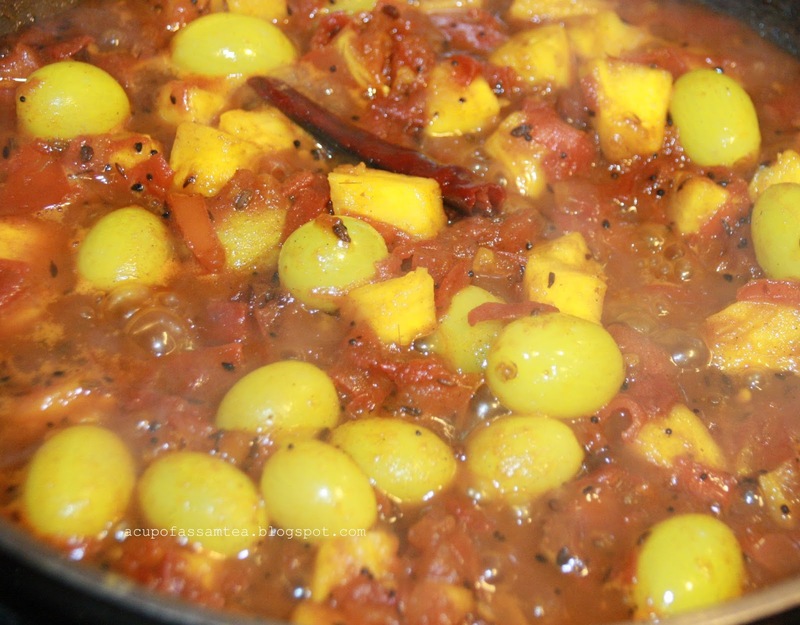 I added fruits like grapes and pineapple for a more fruity flavor. The best part of this recipe is that it is prepared with jaggery or molasses, which is known for digestion and many other health benefits compared to regular white sugar. My mom used to make kheer (Indian rice pudding) for our birthdays. I skipped it this time. 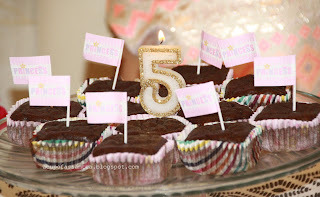 Our birthday girl wanted to have a homemade chocolate cupcake. I made it for her. Our little one enjoyed her birthday very well as we used to enjoy as a kid. But she refuses to have a homemade cake for her actual birthday as mommy is not good at decoration. Happy weekend guys! You can have it without the carbs. Never heard of this dish...may have to try someday. Thank you Kentaro. it's a chutney ! Nice tomato chutney. Nice memories of childhood. The little story you told along with this was EVERYTHING. Seriously. It was a nice glimpse into your childhood and culture and I think most of us who are moms understand the conflict between wanting to recreate our own happy memories with our kids who have different ideas lol. And the chutney recipe was nice too - I like the fresh fruit addition. Ah so true . Thank you so much!